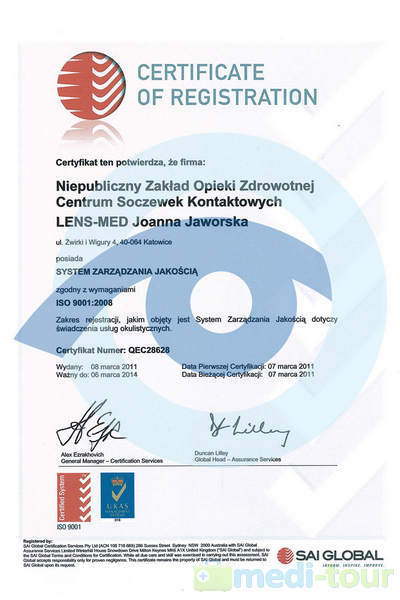 The clinic is located in Chorzow in Silesian region and belongs to the network of Optomed ophthalmologic clinics in Poland. 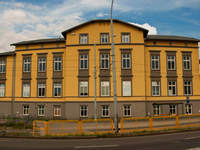 The hospital was opened by the end of 2013. 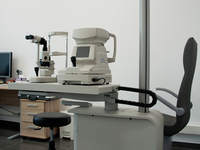 Modern equipment and experienced medical staff assures a full range of diagnostic tests and surgical procedures in ophthalmology. 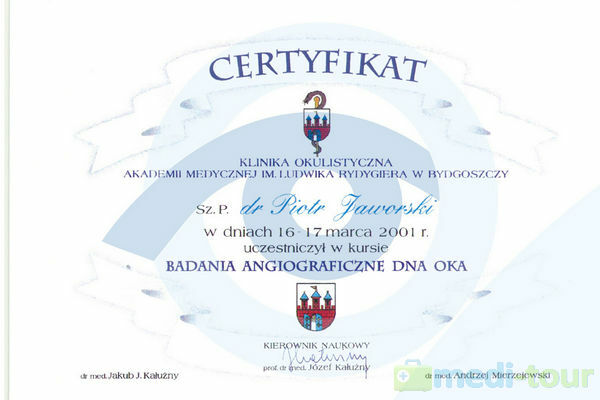 The hospital meets the most stringent EU standards in healthcare, and additionally has an exclusive appearance. 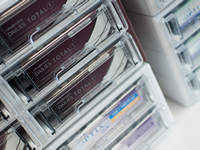 An optician, located within the clinic, recommends proper selection of optical eyeglasses, sunglasses and contact lenses. 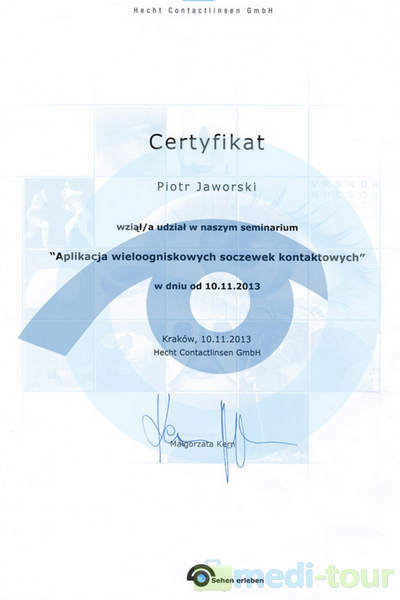 We have SAI Global Certificate. 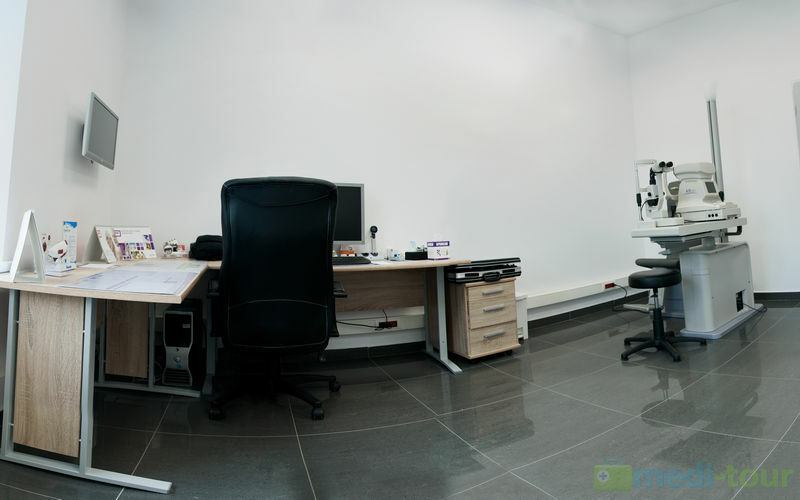 Optician offering selection and sales of contact lenses and eyeglasses. 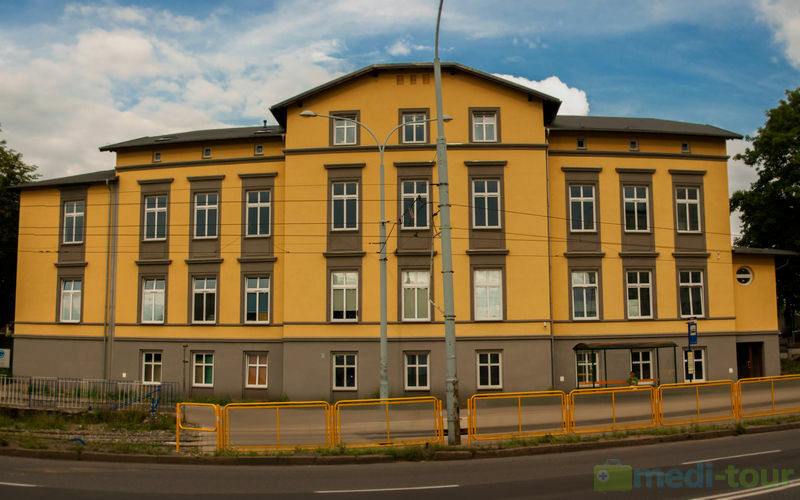 The hospital is conveniently located, close to the A1 and A4 highways, Katowice -Pyrzowice International Airport and Central Railway Station in Katowice. We provide transportation and accommodation for people accompanying patients, and assistance for people accompanying “single-day patients” for planned procedures performed in one day, without hospitalization. 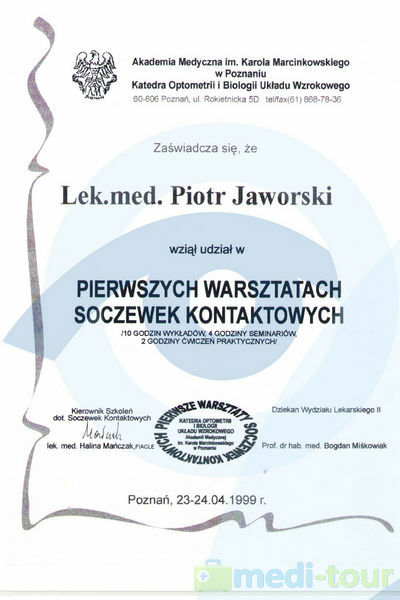 Optomed network was established in 1992, initially as a private surgery in Katowice, specializing in rare and difficult to treat eye defects. 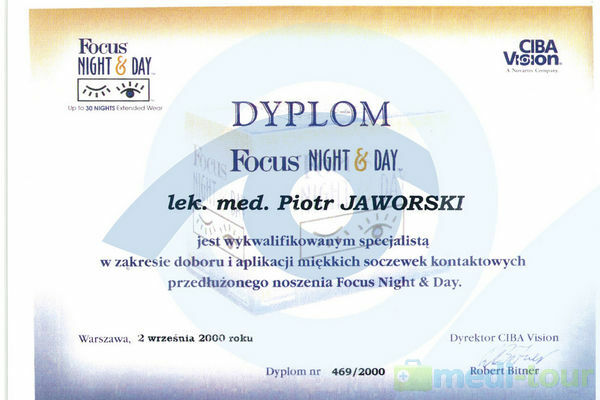 During the years of working with patients, we gained experience and became a leading ophthalmological center in Poland. 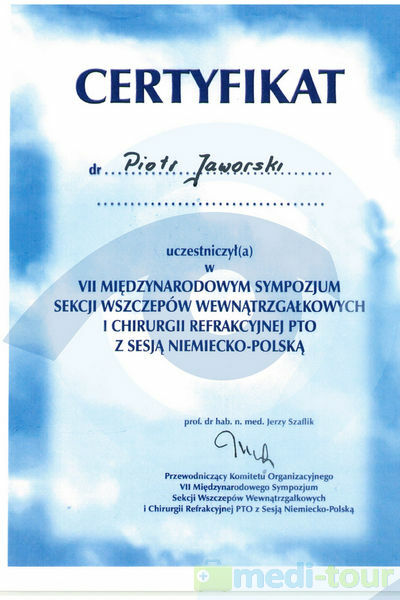 Since the very beginning of our activity, we have concentrated on innovation and modernity of our equipment. 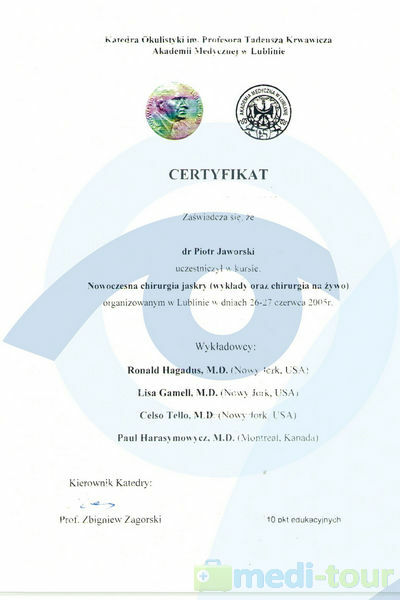 We take pride in implementing unique methods in treatment of lachrymal ducts on a global scale. As one of the few resorts in the world, we use a laser and a micro-endoscope to restore lachrymal patency, leaving no scars. 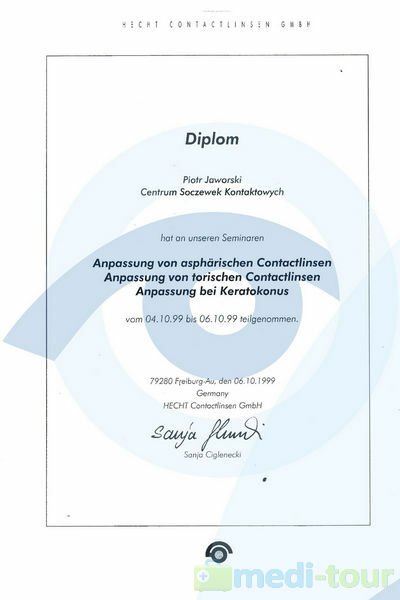 We have developed a method for selecting lenses, both contact and phacoid, which resulted in obtaining a patent in 1998 for an innovative method of lens selection. 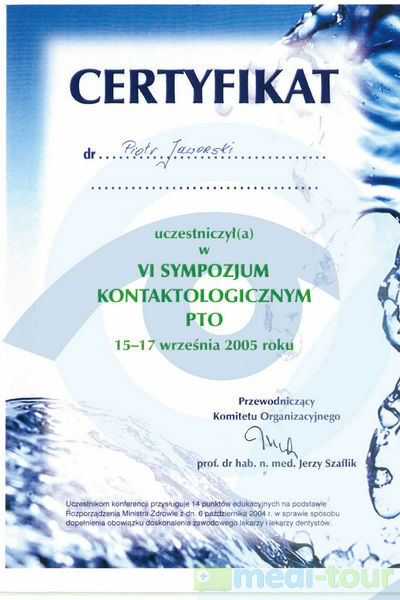 Our experts are frequently invited to make presentations at many national and international conferences. 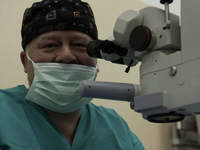 plastic surgery around the eyes - removal of dermatochalazis, xanthelasma. 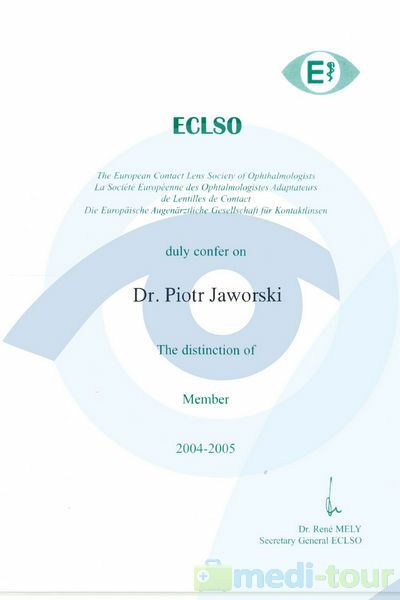 correction of vision defects - selection of eyeglasses, contact lenses and ortho-corrective ones (correction of vision defects by lenses worn only at night). 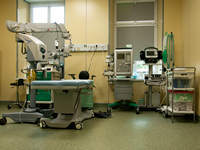 During surgery, we offer the choice of anesthesia - local or general. 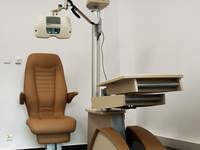 Before and after surgery, our patient may stay at the located close to hospital parks , which allows to take a good relax. 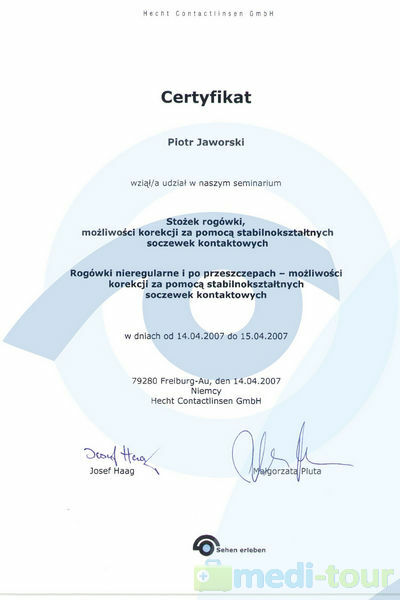 In case of short medical procedures, that do not require hospitalization, we can organize your stay at nearby hotels like : the four-star Arsenal Palace in Chorzów or three-star BellaNotte in Chorzow, which are no more than a 5 min. walk from the hospital. 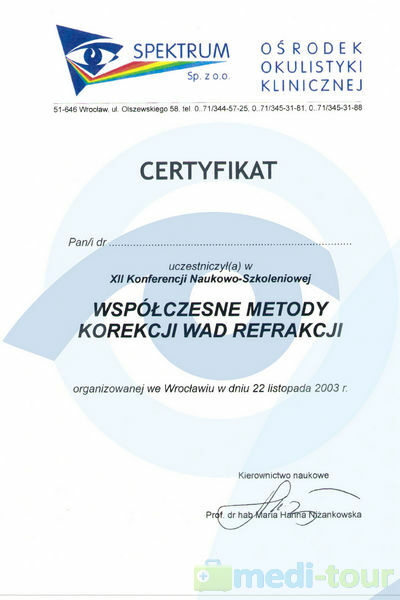 We can also recommend the Hotel in Donesmark family palace in Świerklaniec, together with an extensive park complex, which is a 10-minute drive away. On special requests, we can arrange accommodation in hotels of different standards than those given. We also provide transportation for you and accompanying persons from the airport and train stations or other selected points. 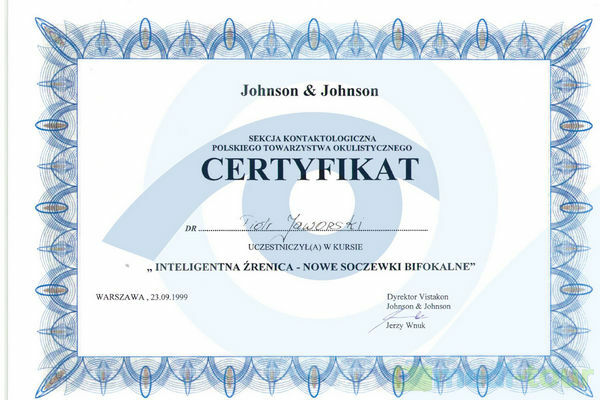 For the safety and comfort of patients, a sworn - in interpreter of required language is available. • Eye surgery: cataracts, lacrimal ducts , plastic surgery , reconstruction of eyelids and the eye, orbital implants , surgery, glaucoma, keratoconus , Intaxes , Cross -linking , strabismus , diseases of posterior segment of the eye, the retina , and others. 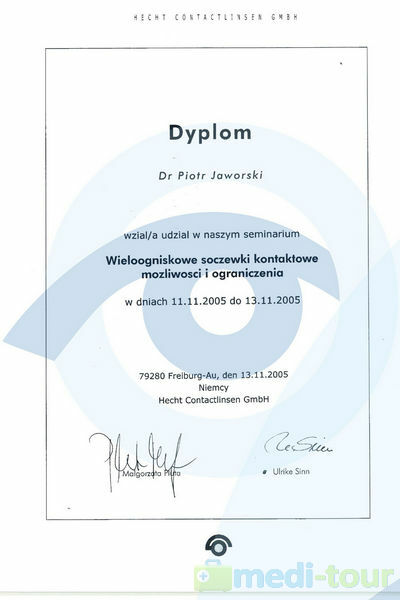 Doctor Piotr Jaworski graduated from the Silesian Medical University in Katowice and specialized in the field of ophthalmology. 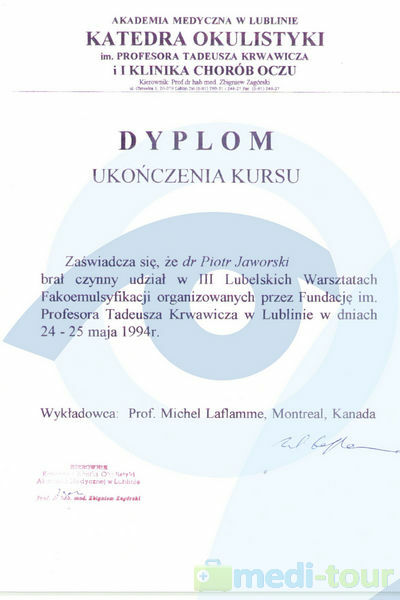 He improved his professional skills in many centers in Poland and abroad (including an internship at the Institute of Ophthalmology Fyodorov in Moscow). 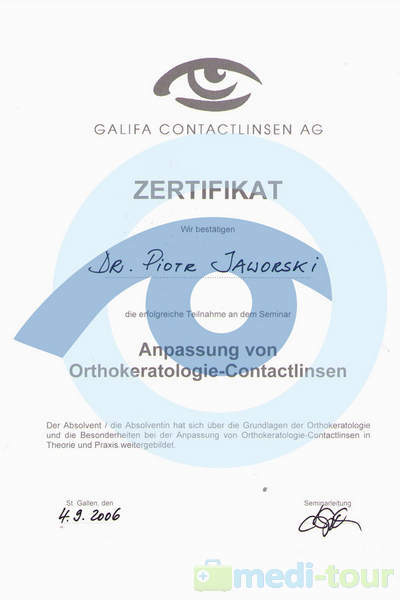 Doctor Jaworski also completed a number of specialist trainings in the field of micro-endoscopy in Como (Italy ) , orbital surgery- in Rostock ( Germany) , implantation of INTAX and application of contact lenses in San Paulo ( Brazil ) and Paris. 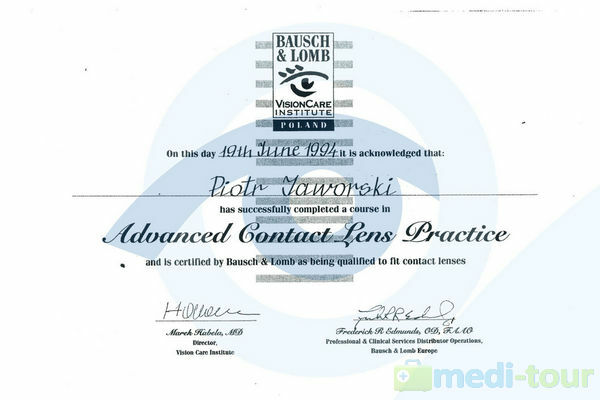 In 1996, he constructed and patented measuring equipment, defining the angle of axis rotation of the contact lens. 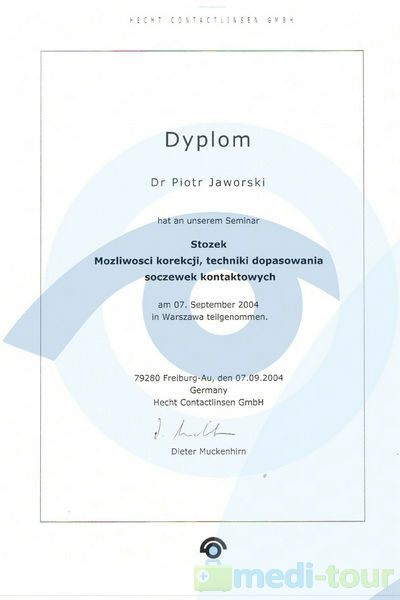 Together with a team of doctors from the Center for Eye Microsurgery Optomed, they were the first in Poland to apply the so-called Polish technology of individual soft and hard lens selection , as well as the technique that uses laser combined with micro-endoscope to reconstruct lacrimal ducts. 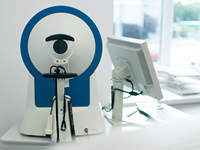 In 2010, we completed the construction of a prototype apparatus, which was a microscope for positioning implants , and in 2012 we constructed a unique, on global scale , apparatus for testing visual acuity and nystagmus - Optonystagmograph . 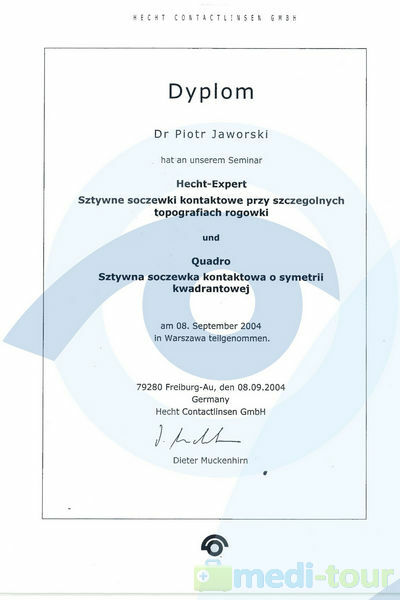 He is the author of many works on contactology and ophthalmic surgery. 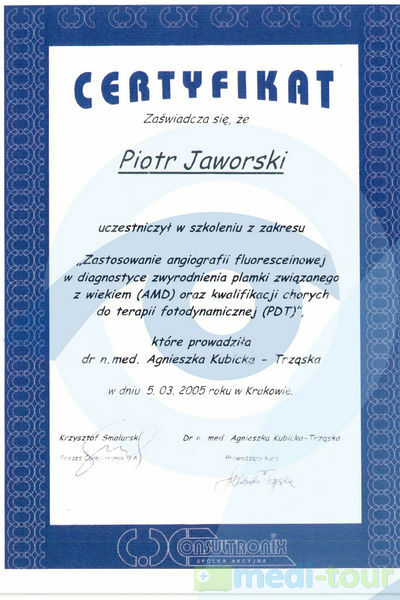 In 2000, she was the first in Poland to introduce AMD treatment, using photodynamic therapy, which was also the subject of her Ph. 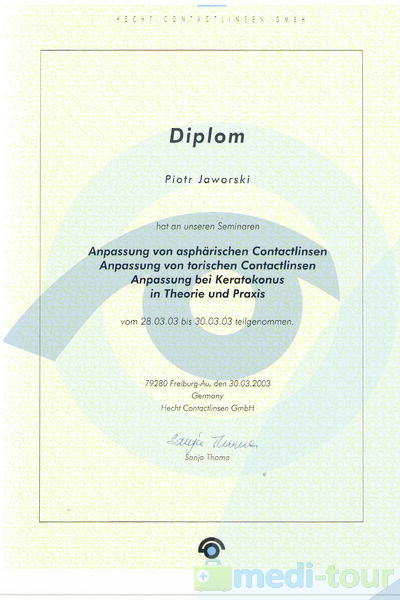 D thesis. 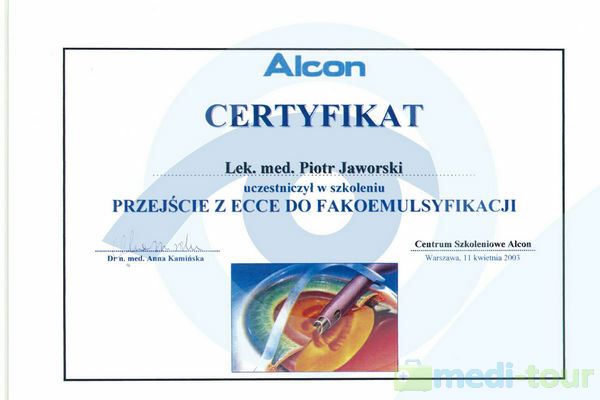 Since 2006, dr Wykrota was again the first in Poland to treat AMD by injecting into the vitreous humor of the eye preparations of anti-VEGF; initially of Macugen and next of Lucentis since 2007. 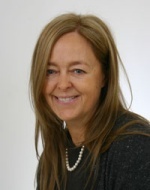 She is the author of numerous publications in professional journals and reports presented at symposia in Poland and abroad. 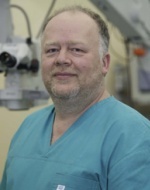 At present , dr Wykrota is mainly engaged in diagnoses and treatment of diseases of the retina at the private hospital-Eye Microsurgery Center in Katowice. A healthy eye has an almost transparent apparatus focusing light rays - known as the lens. The transparency of this organ determines correct, clear vision and the lens works like a camera. In humans, it is convex on both sides, which allows to focus sight on the subject. The lens is composed of protein, letting through rays of light, called crystallines. This protein is formed in fetal life and does not regenerate in following periods. 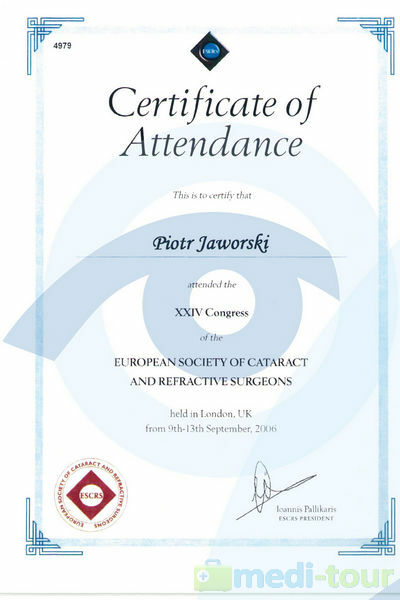 However, over the years, the protein gradually begins to become impervious to light, and the stage when most of the protein undergoes such modification thus preventing correct vision - is called a cataract. 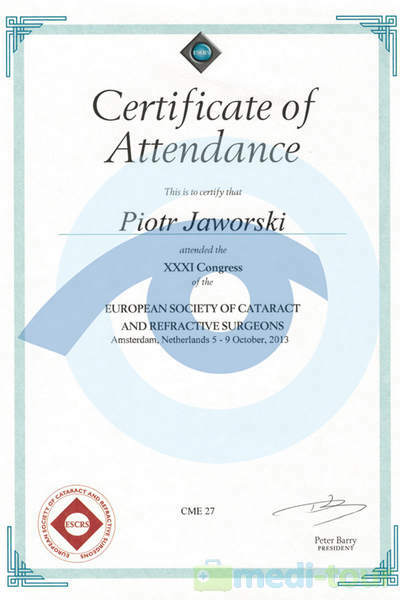 Cataract is treated by surgery only. 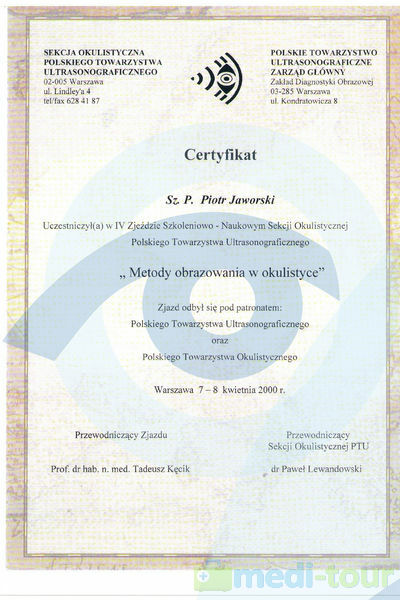 Phaco-emulsification of the lens is used. 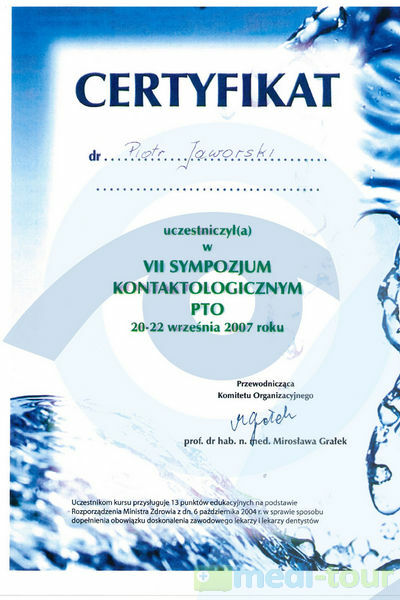 Every year, millions of people undergo such treatment with excellent results. 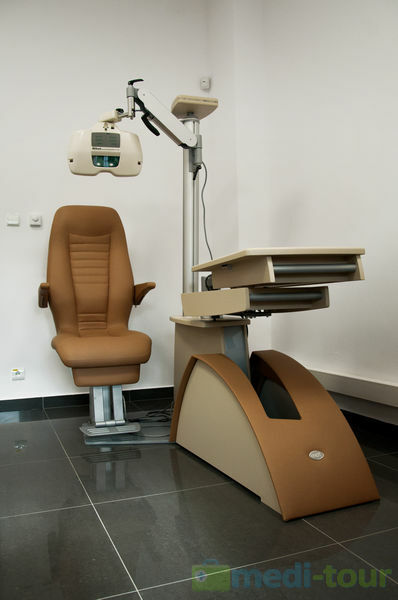 At present, it is the safest method that allows the patient to resume quickly normal functioning. 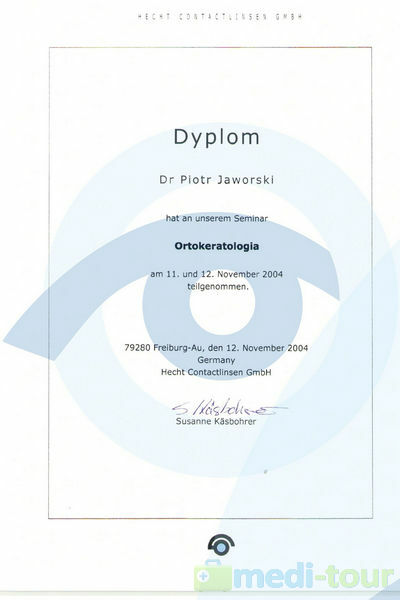 During the procedure the "old" lens is removed and a new one , so-called intraocular lens (IOL) is placed in. 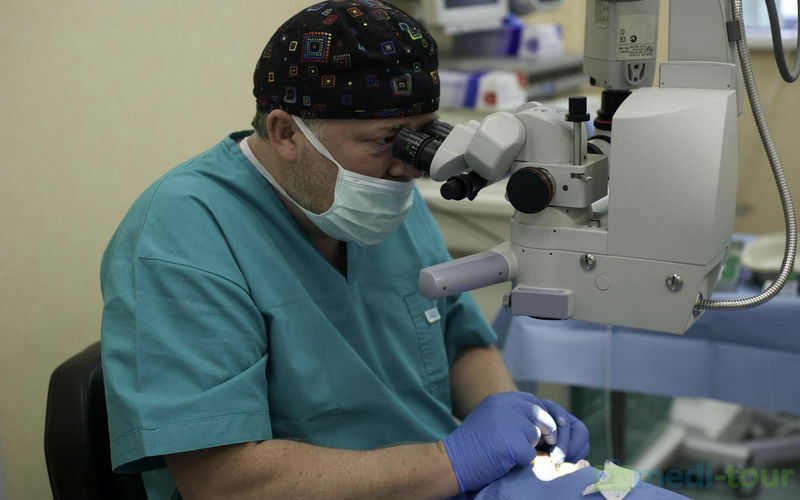 Currently intraocular lenses (IOL), implanted during cataract surgery, allow for near, distant and mid- distant vision. 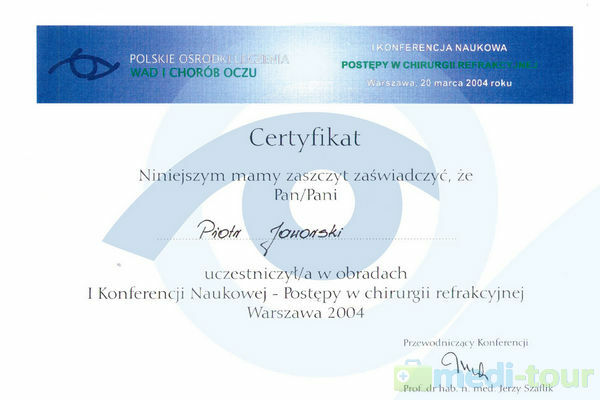 They restore visual acuity from the time before the disease and correct vision defects that were previously corrected by glasses. 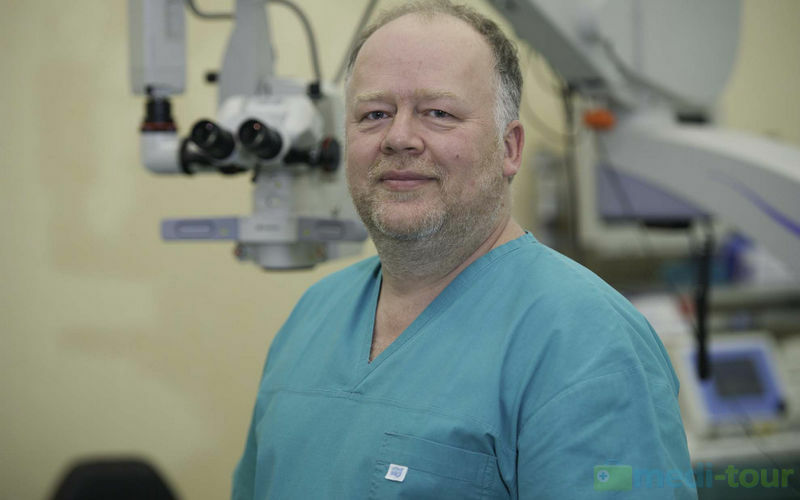 How is phaco-emulsification surgery performed ? 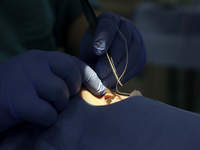 A small incision at the edge of the cornea (2,2-2,8mm) is made, which allows to avoid using sutures so that the patient does not feel any discomfort associated with them. 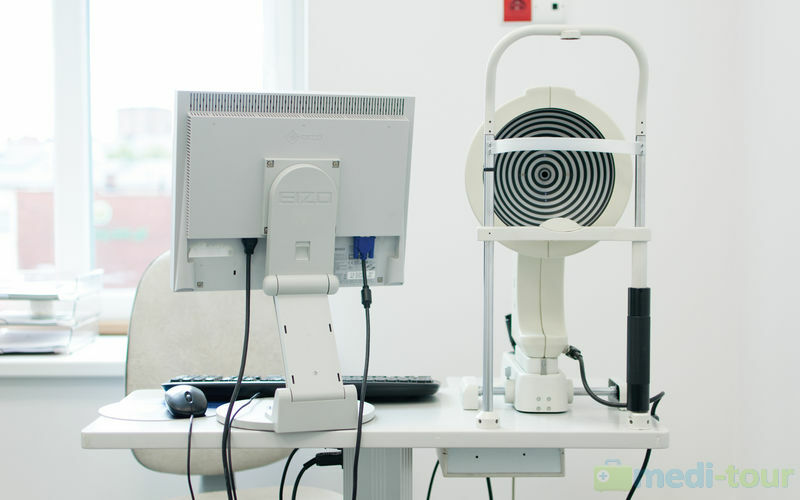 The turbid lens is softened by ultrasounds so that it can be easily removed. 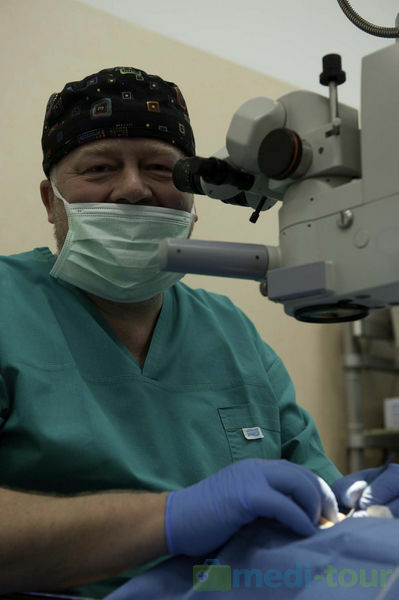 In very rare cases, when the lens is too hard to be removed in this way, an indirect method is used, in which a larger opening is made to remove the turbid lens but it entails the use of sutures. 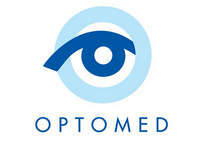 Finally, an artificial lens ( IOL )is implanted (Intra Ocular Lens). 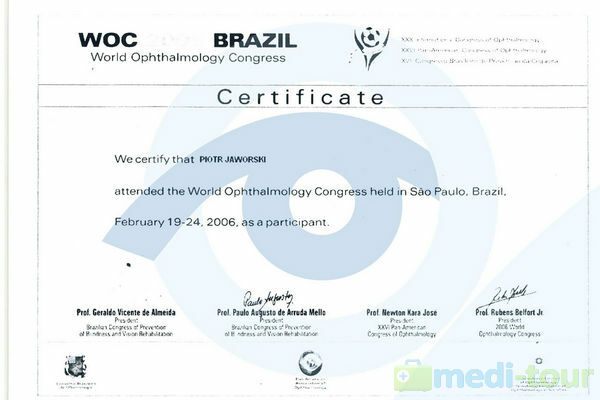 Before surgery, the type is selected by an ophthalmologist (table on the next page describes each type of IOL). 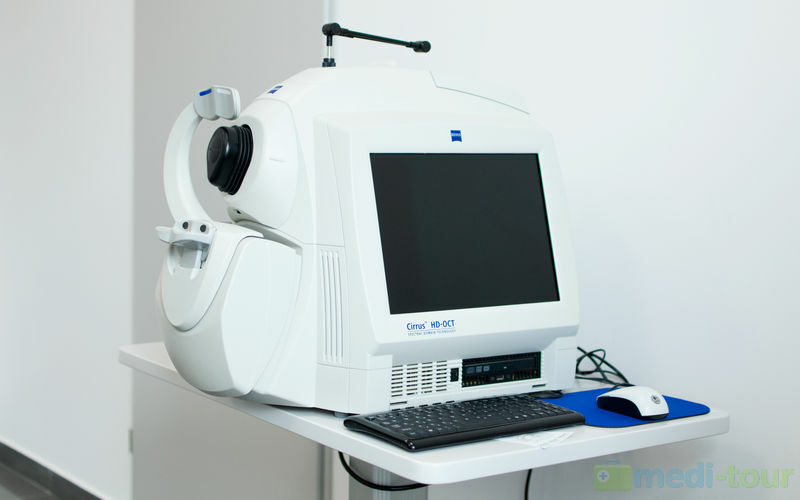 During the entire procedure, the ophthalmologist uses a special microscope, which guarantees the highest precision movements. 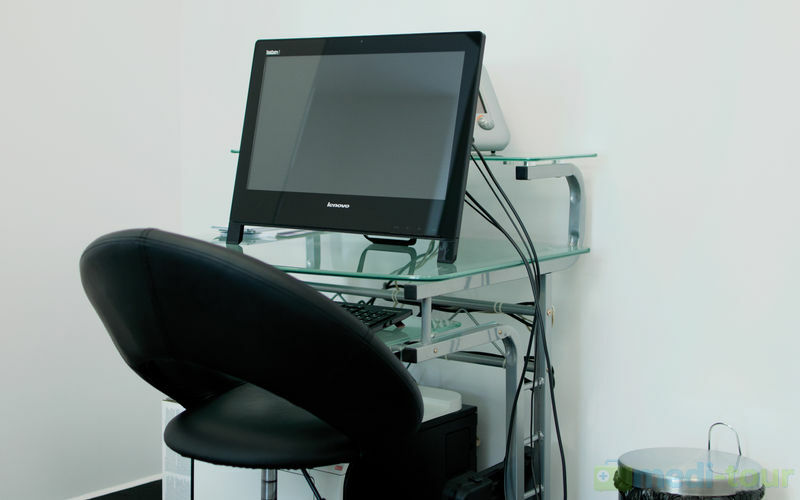 In our institution, we offer the AMD treatment using vitreous body injections of Lucentis and EYELEA. AMD is a disease of the retina. 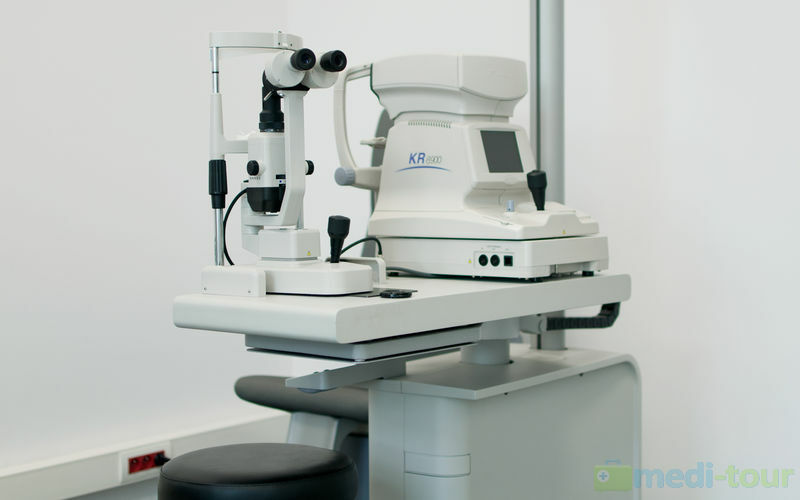 The retina is a thin, like paper tissue, lining the posterior part inside the eye. 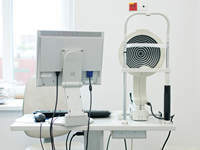 Photosensitive retinal cells are responsible for converting light into electrical impulses that are sent through the optic nerve to the brain for interpretation. 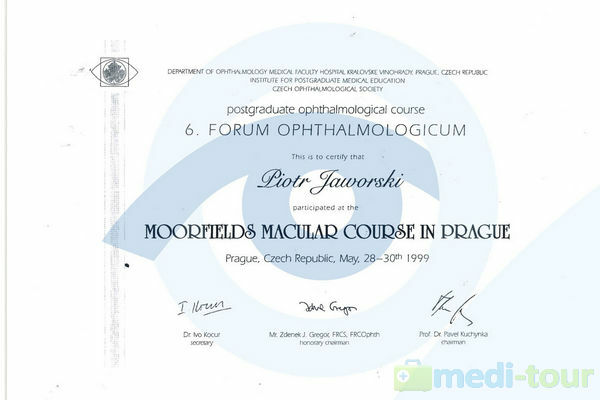 In the center of the retina there is the most important area - the yellow spot, commonly called the macula. 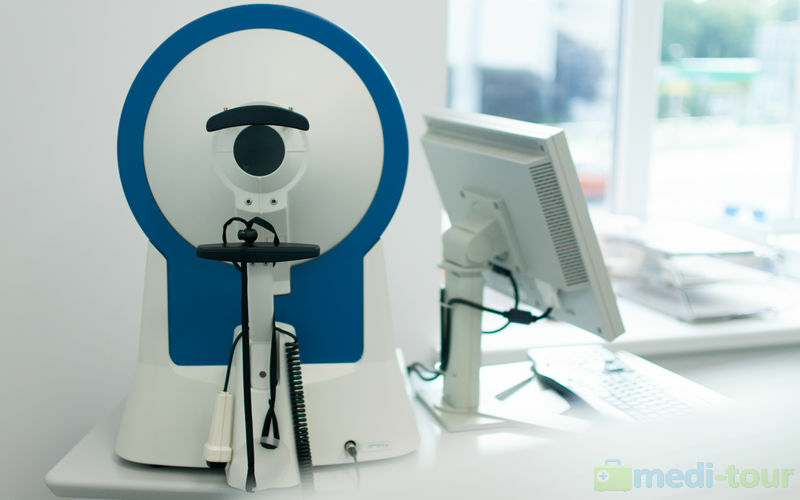 The macula contains the highest concentration of light-sensitive cell - rods, which are responsible for sharp, detailed central vision - that is, everything that we see in the center of our vision field, when, for example, we recognize the faces of other people, read, drive a car, etc. In a person with AMD, rod cells in the macula area begin to die, causing spots in vision and image distortion. 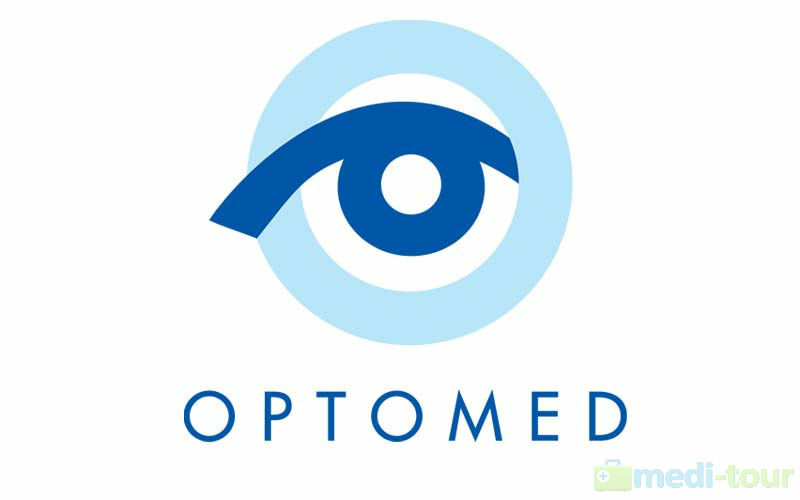 Since the loss of sight in the wet form of AMD is caused mainly by the growth of abnormal blood vessels that eventually damage the retina, a drug designed to inhibit their development was invented. Lucentis is an antibody fragment that binds to vascular endothelial growth factor (VEGF) and thus inhibits its activity. It is believed that VEGF plays a key role in the formation of new blood vessels. Lucentis is injected into the vitreous of the eye (vitreous is a clear gel-like substance filling the eye). VEGF is continually produced, and therefore Lucentis administration needs to be repeated. 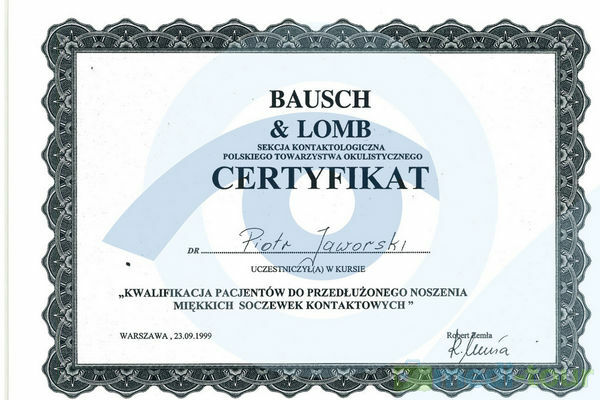 The decision on administering Lucentis is taken by a retina- ophthalmologist, based on diagnostic examinations, who also determines the frequency and schedule of repeating injections. 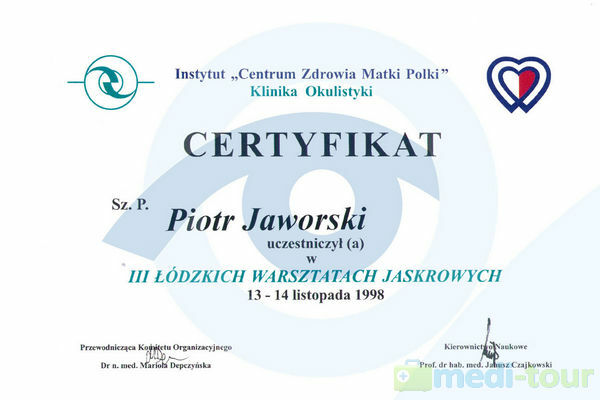 Most frequently three injections as the beginning of treatment are required, at intervals of 1 month and then, the decision about the next injection is made after eye examination, observation of the drug reaction and the progress of the disease. 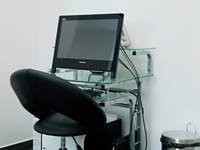 The procedure is little invasive, however, requires a special preparation before and monitoring after implementation. 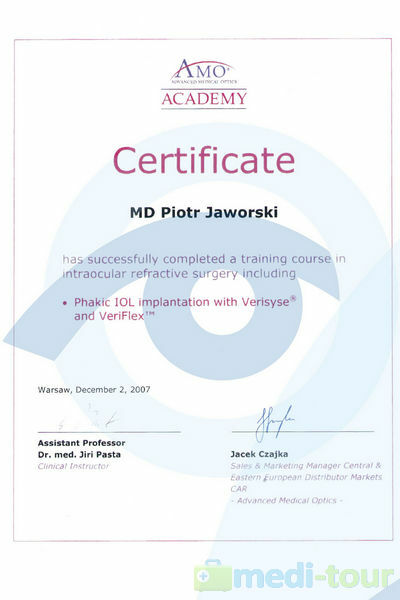 Injection treatment into the vitreous of the eye should be performed in the operating room, at complete sterile and aseptic conditions to minimize the risk of infectious complications. 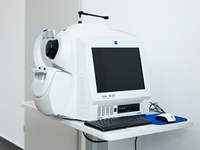 This treatment takes advantage of unique structural characteristics of the cornea. 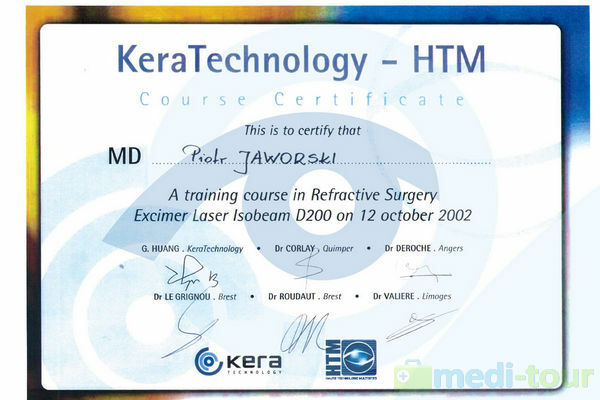 UV irradiation causes ormation of collagen cross bindings, called crosslinking of the cornea so that it is the stronger, stiffer and less prone to deformation, which slows down further development of keratoconus. 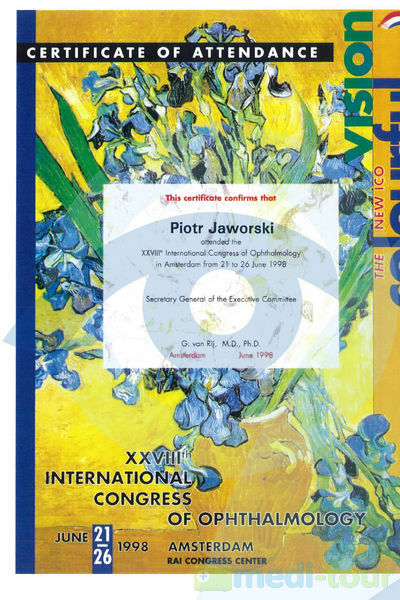 The intra-cornea ring implantation method (INTAX or Intacs or INTAKS) was originally developed for the correction of myopia and minor astigmatism, however, it did not become popular. 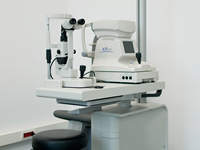 Due to its mechanism, a tendency to cause tightening of central parts and stabilizing the cornea, this method has been suggested to be used in the cone of the cornea. 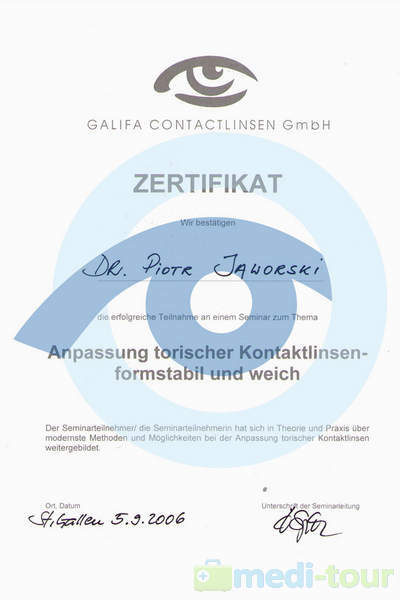 According to the manufacturer's instructions, INTAXES should be used in patients who cannot or will absolutely not tolerate hard contact lenses. 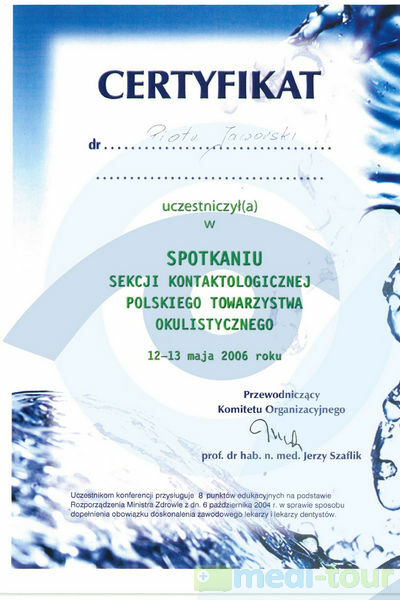 This method does not inhibit the progress of the disease, and it is not possible to achieve such good vision as with contact lenses. 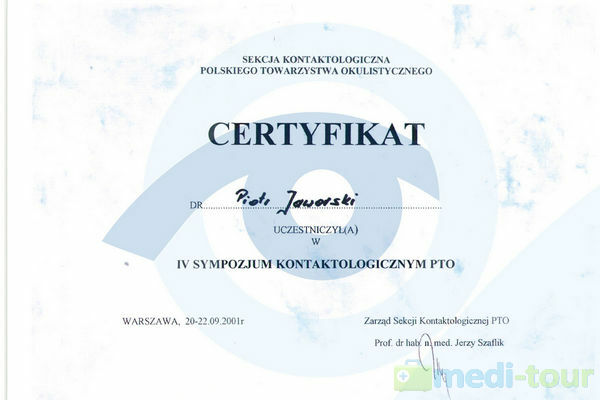 It allows to improve the vision with regard to above - mentioned indications and postpone the moment of cornea transplantation due to refractive indications. 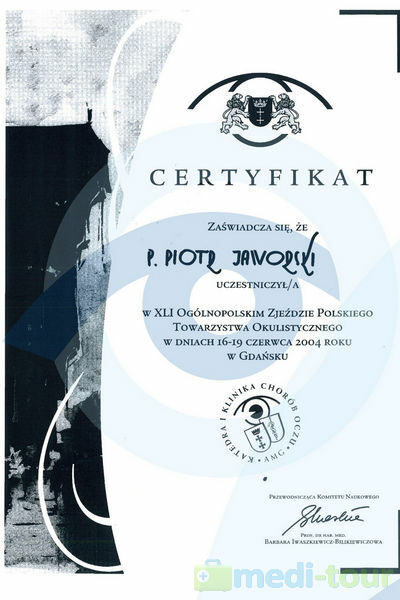 There are methods that combine the two procedures - INTAKSES and Cross-linking. 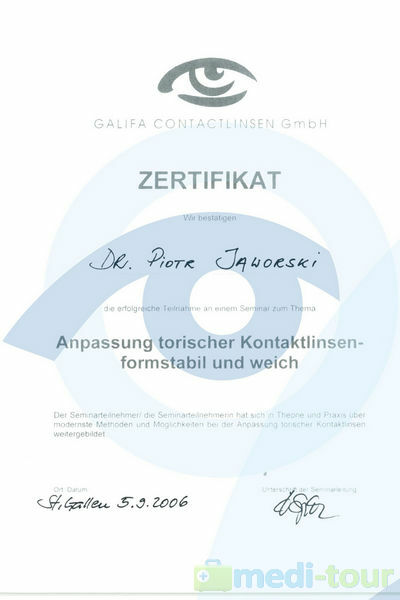 Intacs is a highly sophisticated method of extasia treatment and keratoconus. 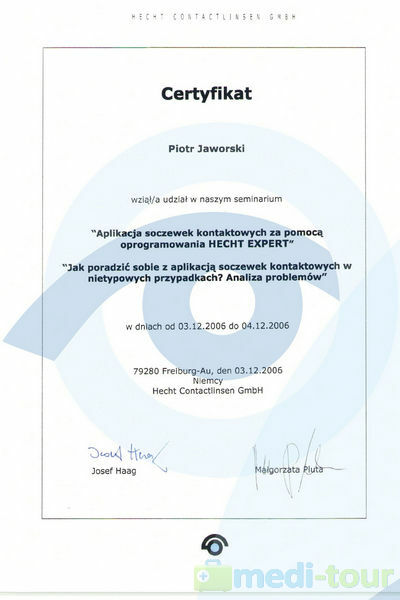 It has a very rich, over a 15-years of clinical and scientific documentation. 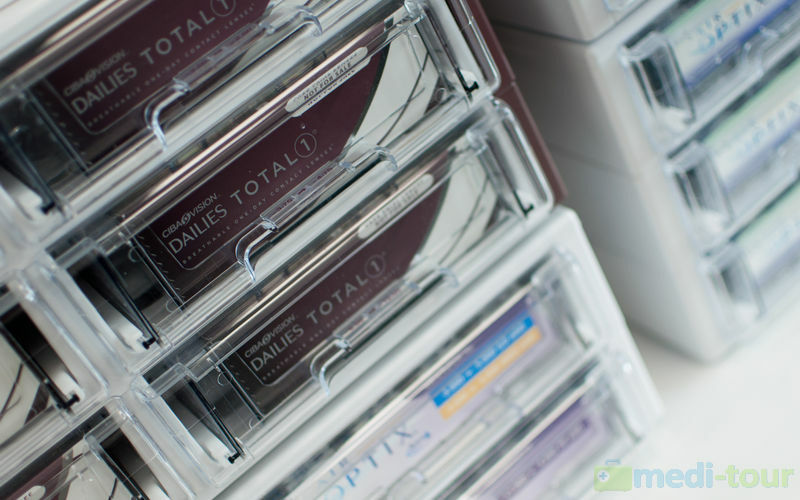 INTACS Corneal implant aligns and flattens the cornea, helping to select effective and proper contact lens to the eye. 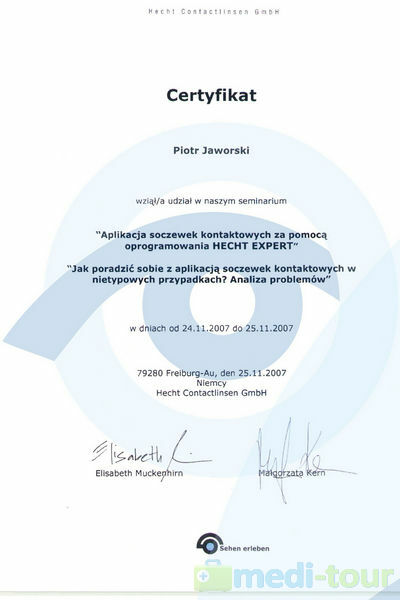 Intacs Corneal Implant helps ensure the patient most useful improvement in visual acuity. 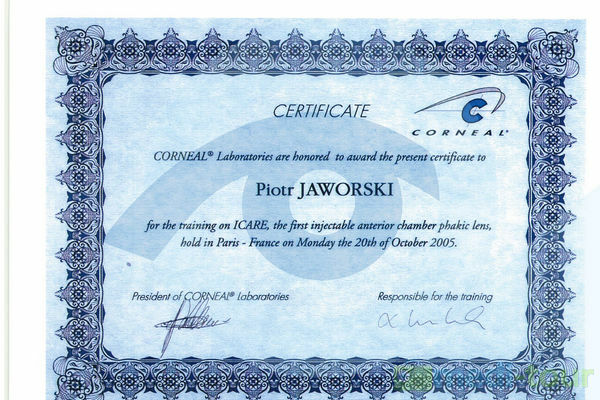 Intacs Corneal Implant stabilizes the cornea, which delays the need for a corneal transplant. 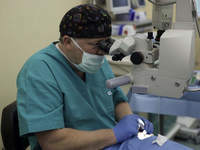 According to a survey on 76 US ophthalmologists who carried out 2136 INTACS operations, only 1.9% of the patients had to undergo a corneal transplant as a result of the development of keratoconus (operations carried out between August 2004 and April 2008). 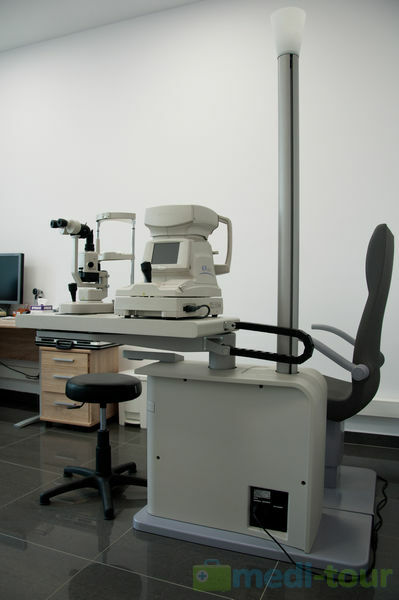 During surgery of keratoconus , Intacs surgery and Cross-linking treatment can be combined. 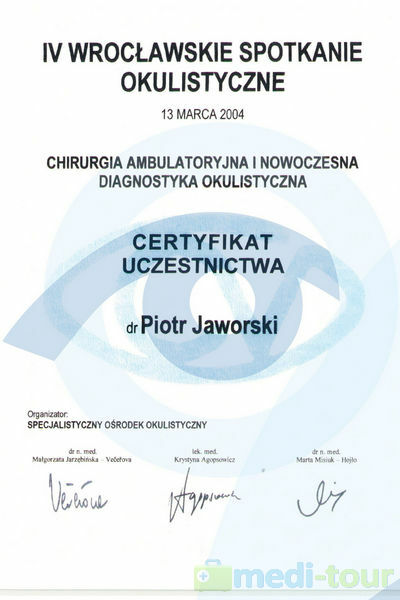 Lacrimal surgery has been carried at our center since 1992. Up till today, we have performed several thousand surgeries of restoring lachrymal duct patency by applying all known methods. 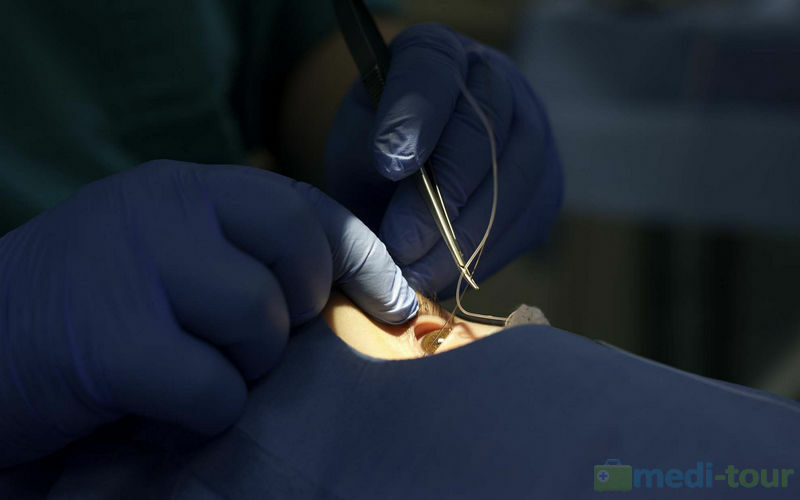 No scars are left with the use of micro-endoscope and lasers in such operations. 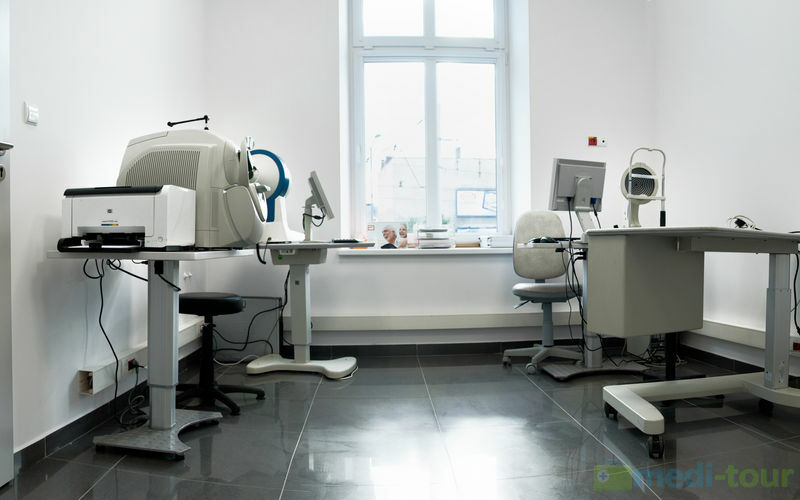 At our center, we manufacture moving eye prostheses and epiprostheses. 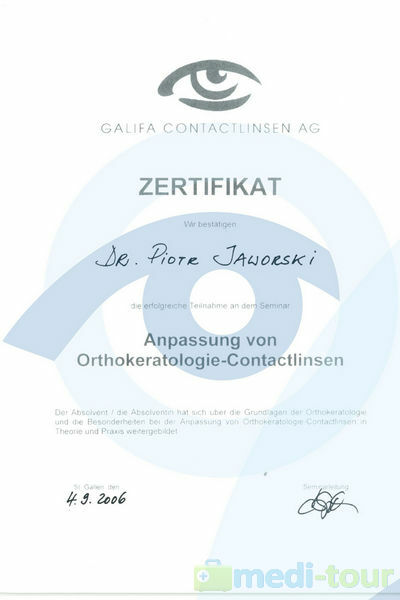 Each prosthesis is individually adapted and performed by an ocular prosthesis specialist. 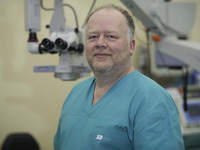 We also offer PIN-expanders used in the event of a significant orbital tissue loss, which should be complemented. 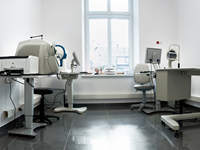 PIN-expanders allow to place the implant properly in the eye socket, as well as significantly reduce the effect of upper eyelid dropping and epiprosthesis. 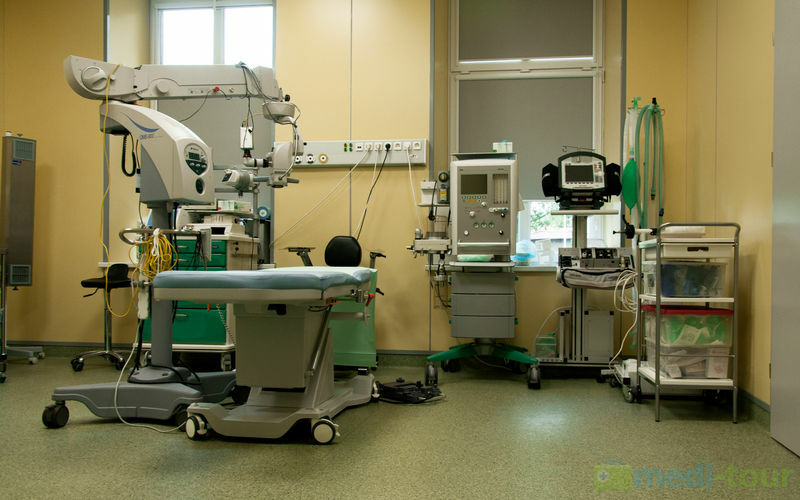 Prostheses at our center are performed for both children and adults with diseases of the eyeball or its absence. 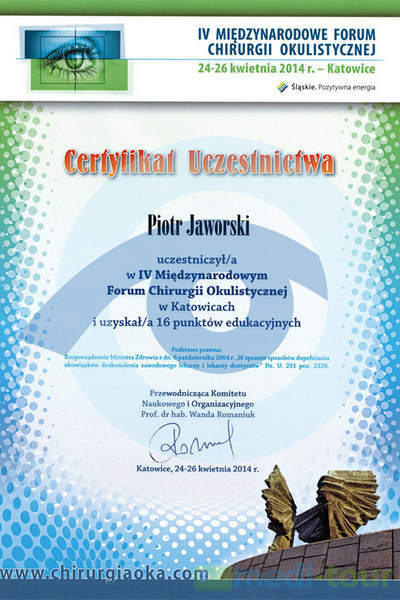 For children, early exercising and regular replacement of prosthesis provide adequate development of orbital structures, going with the development of the child.